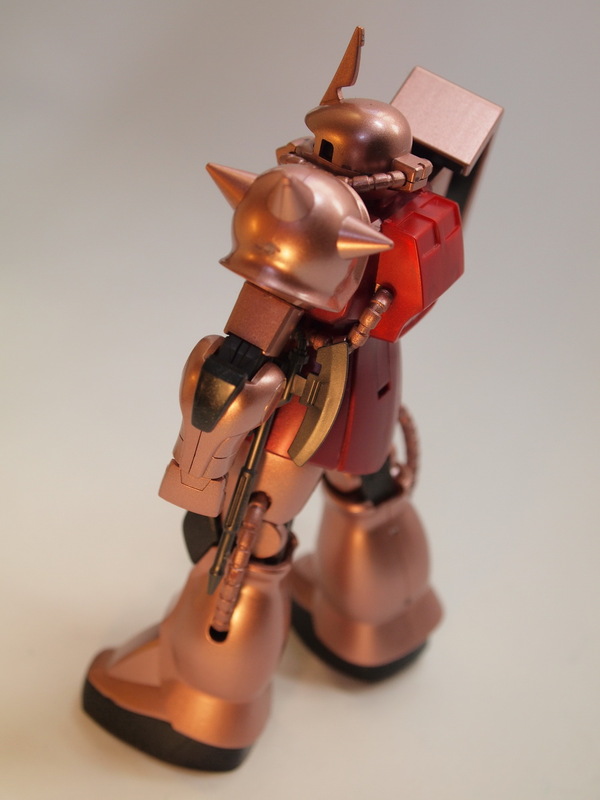 The Extra Finish Version of Char’s Zaku II was one of the limited kits that was sold at the Gundam Expo held in August, along with it’s bigger brother the MG version. Well, it was only 2,000 yen, so I figured what the heck. 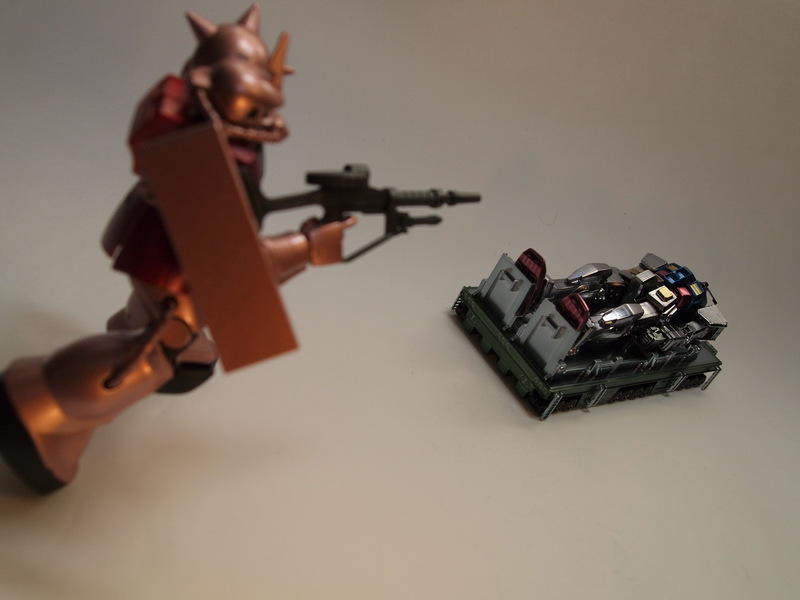 Overall, it’s a Zaku, so you all know what you’re getting, but this was my first time building it in the HGUC scale. 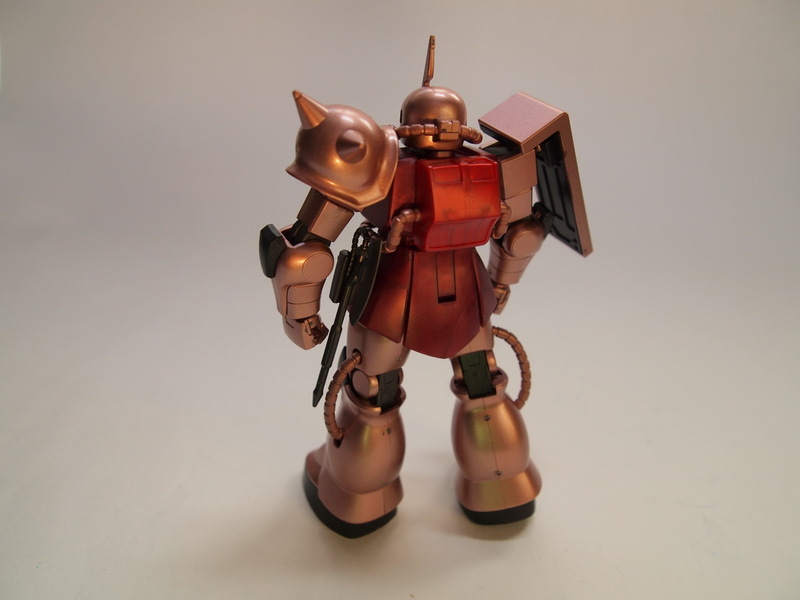 Overall impressions are well… it’s a Zaku! What more can you say? Actually, there’s a quite a bit you can say. 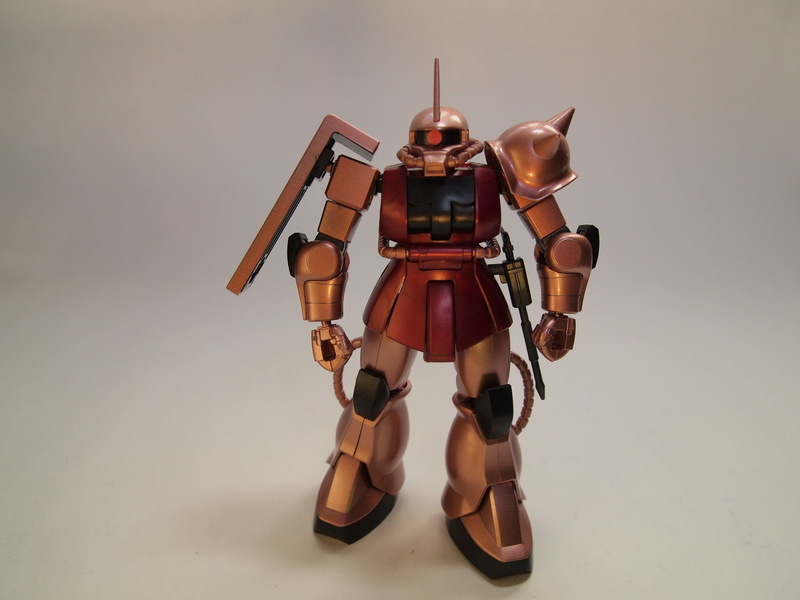 The Zaku in the HG line is one of the oldest kits out there, so it obviously doesn’t stand up to it’s MG kit, or even some of the later HGUC kits that have come out which feature better design in hiding seams and gate sprue damage. 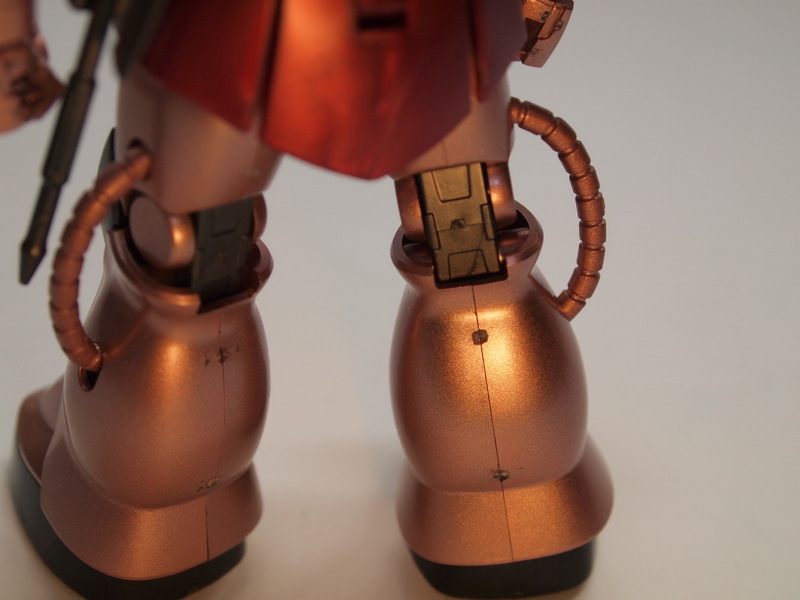 The HGUC kit is also further limited by having basically no waist movement, so don’t expect it to twist around to shoot something behind it, over even to the left or right of it so much. Also, I actually had a few pieces that simply didn’t fit well, most notably on the lower right leg armor, where it simply leaves a slight, but noticable gap. Other than that, the proportions of the monoeye and visor(?) area feels a little off to me, the eye is much bigger than you see in MG kits, so in that sense I find it a little disconcerting. 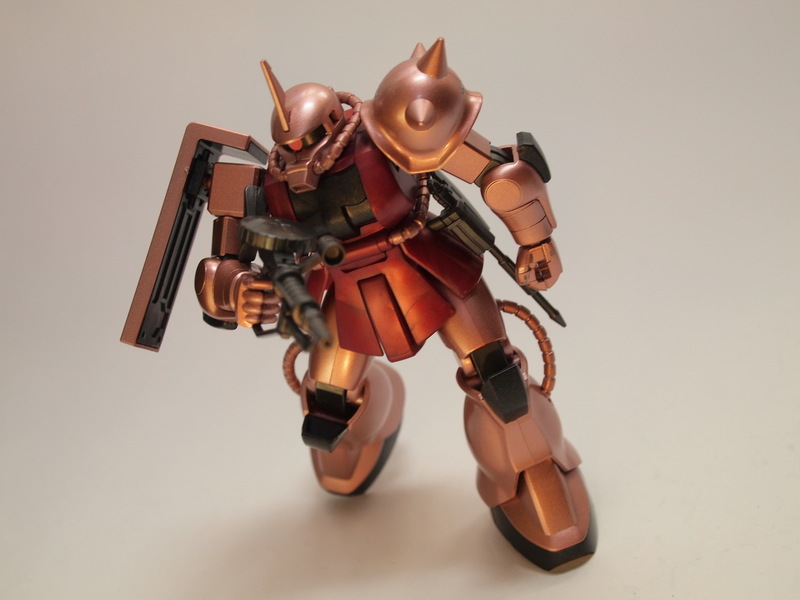 Colorwise, the extra finish is beautiful, and fits my image of Char’s Zaku much better than the closer to pink rather than red coloring it always gets. The downside? Unfortunately, the extra finish as we’ve learned from kits such as the Hyaku-Shiki, is a double edged sword, meaning you’re going to have nice gate damage that isn’t the same color as the finish. While the Hyaku-Shiki’s runners and build itself was designed to hide such damage or at least keep it to a minimum, the Zaku II kit here doesn’t get the same luxury. The good thing is it’s a smaller kit, so perhaps it’s not so noticable from a distance, or from the angle you take the photo. 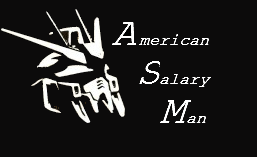 Still, this is one area that I’d like to see Bandai step up to the plate on. If they’re going to go through the trouble of charging twice or more for the regular kit just to have the extra finish, then I’d like to see them go the extra mile and either redesign the runners with sprue gate damage in mind, or better yet, go to an all undergate solution. When snipping off pieces, sanding and design knifes just don’t cut it since you’ll end up taking the finish off around the sprue area. Still, overall the damage doesn’t detract from the kit that bad. Wrapping up, the build only took about an hour to do, again the good thing about simple HGUC kits, coupled with the fact that you can’t do much sprue gate cleaning due to losing surrounding finish. Also, I refrained from panel lining as I’ve noticed in the past that Gundam Panel Line markers seemed to “rub” off the finish when doing another kit. So is it a kit to get? 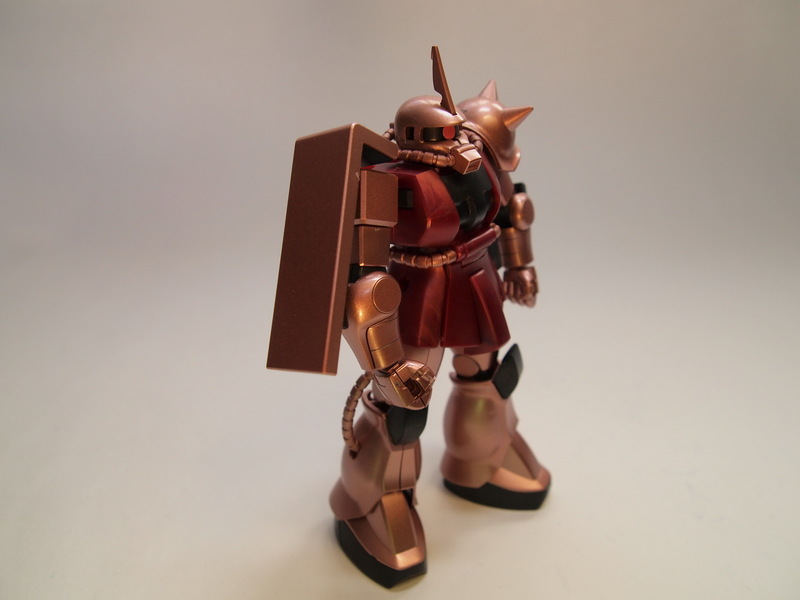 If you like coloring and the finish, and don’t min some detracting gate damage on the lages and shoulder areas, then yes, just realize that it is still “Just Another Zaku” so there’s nothing new in that area. As for the pictures, again, it’s a Zaku, so I really didn’t take a lot, but you’ll see it again in an upcoming post again the good old RX-78-2. Area where the damage stands out. What does he come across…?